I think we’re all a bit spoiled by having delicious, juicy, ready-made rotisserie chickens available at nearly every grocery store. I use them a lot. They’re a great way to pull together a meal in no time. They’re also great to buy ahead, pull the meat off the bone, and bring along any camping trip for an easy throw it together at the last minute meal when out enjoying a wonderful camping experience in the great outdoors. Well, guess what?? I’ve discovered the Instant Pot whole chicken and I’ll likely never be buying a rotisserie chicken again! As mentioned above, I may or may not have multiple Instant Pots (ok. you’ve got me… I have several). I love the Instant Pot Mini for our RV and for meals for 2-4 people. I use my 6 quart for larger groups. Here’s the great thing about cooking an Instant Pot whole chicken… you can do it in any Instant Pot you have! This whole chicken was cooked in my latest Instant Pot acquisition – the NEW Instant Pot Duo PLUS Mini (it’s a 3 quart). I used a 4-pound chicken, which puts out the perfect amount of chicken for soups, casseroles, or chicken salads. If I need more chicken, I’ll use my 6 quart Duo and cook a larger chicken. 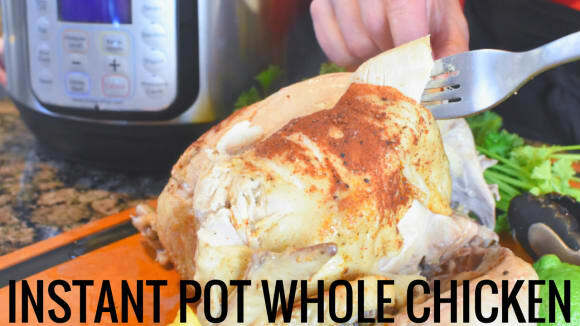 Check out this video to see the Instant Pot Whole Chicken in action! Advertisement: Your video will begin shortly. Make sure to keep that chicken carcass to make homemade Bone Broth in your Instant Pot. Super easy and healthy! Now, if you’re looking for a nice, crispy skin on your chicken, you can get that too (I usually discard the skin when I use rotisserie Instant Pot chickens because I’m typically shredding the chicken to use in a recipe so the skin not important (like for this awesome White Chicken Chili.) First, you can sear the chicken using the sauté function in the Instant Pot before you add the trivet and water to give the skin a nice golden brown color. This alone, however, won’t give you a crispy skin, but you can still get it! Just place the fully cooked chicken on a broiler pan after it’s done in the Instant Pot and pop it under your broiler for several minutes until you get the color and crispiness you want. Instant Pot Whole Chicken - Perfect Every Time! Mix together paprika, seasoned salt, salt, and pepper. Rub seasonings all over chicken. Place trivet inside Instant Pot inner pot and add 1 cup water. Place seasoned chicken inside Instant Pot on top of trivet. Secure lid, ensuring the valve is turned toward sealing. Select the Pressure Cook button and set the timer to 30 minutes. When timer goes off, let sit another 5 minutes to naturally release some of the pressure, then turn the valve toward venting to release remaining pressure. Carefully remove chicken with tongs. Serve chicken as desired.